The New Democrats say a review of Christy Clark's first year on the job shows a government spinning its wheels and generally carrying out Gordon Campbell’s term. But Shane Simpson, New Democrat caucus chair and MLA for Vancouver-Hastings, said, “We’ve seen little real change, many flip-flops and more chaos in the way the Liberals do business under Premier Clark. Simpson said that in contrast, Adrian Dix and the New Democrats are offering positive and pragmatic solutions to address social, economic and environmental challenges and will continue to focus on the issues and the everyday concerns of British Columbians. She may not wear red mittens, but the new premier continues to put photo-ops over real leadership. Premier Clark used the Kitwanga Mill in a “jobs plan” announcement about how important mills are to British Columbia’s economy. The mill has since shut down and the company has filed for bankruptcy. The premier was nowhere to be found when it came to helping the mill stay open. Gordon Campbell’s legacy was to cut taxes for corporations and the wealthy while families paid more for long term care, medical services premiums, tuition fees, hydro rates, ferry fares and more. Under Premier Clark it is more of the same. We are still paying the HST, with the Clark Liberals foot-dragging on the transition back to the PST. Ferry fares will increase even more on April 1. And Clark’s first budget includes another medical premium increase, for a combined Campbell/Clark increase of 85 per cent or $732 per year for families with children. This week it’s the B.C. Place/Telus naming fiasco where the Liberals walked away from $40 million and counting, but we’ve also seen the $30 million payout to compensate Boss Power, $6 million to convicted Liberal insiders in the B.C. Rail scandal, $100 million blown on a K-12 student information system, and the billion dollar B.C. Hydro smart meter program. Remember Gordon Campbell’s 2009 pre-election budget, with the $495 million “maximum” deficit that ballooned to six times that amount shortly after the election? Premier Clark now predicts a miraculously balanced budget by 2013 - right after the next election. Her plan relies on a massive fire sale of public land and assets with no provision for major new costs like the federal crime bill. Gordon Campbell’s last budget froze funding for post-secondary education. Premier Clark tabled a jobs plan with no training plan. Her 2012 budget cuts funding to B.C.’s colleges and universities by three per cent over the next three years. Despite the premier’s so called jobs plan, the Liberals have put zero new money into skills training, and are even cutting their contribution to the Industry Training Authority. Growing inequality continues. B.C. has ranked worst among the provinces for eight years in a row for child poverty, but Premier Clark has no poverty reduction plan. On the Missing Women’s Inquiry, Clark’s initial claim to want to hear all the voices did not translate into real support for aboriginal women. As a result, the inquiry is unravelling with aboriginal organizations and legal counsel deserting. One of the most confrontational ministers in Gordon Campbell’s cabinet, as Minister of Education Christy Clark picked fights with teachers, stripped contracts and brought in funding formula changes that have hurt students. With Bill 22, Clark’s Liberals are again fighting with teachers, and hurting students and public education. Gordon Campbell’s Liberals sat idly by as tens of thousands of forest jobs were lost and dozens of mills shut down. 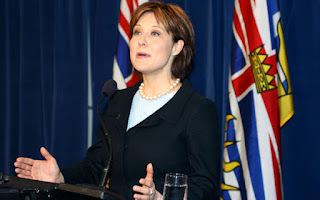 Under Christy Clark, the problem has only gotten worse. Job losses now total more than 35,000, while mills shut down for lack of wood. Clark's forest minister is issuing ministerial orders that deprive local mills of wood (putting B.C. jobs at risk) and allowing an increase in raw log exports against the recommendation of his own committee. Premier Clark continues to support more oil tankers on our coastline. She said it was "dumb" for the federal government to reject the Taseko mine plan, despite strong First Nations concerns and serious threats to an ecosystem. And we have yet to see legislation banning cosmetic pesticides. February’s scathing report on forest health found that we don’t really know the true condition of our land base after a decade of underfunding and lack of leadership. The Liberal response was to argue about the auditor general’s numbers and deny the problems. We have seen an ombudsperson review outlining the sad state of seniors care after 11 years of Liberal policies. And a tragic report on the deaths of three children at the hands of their father found numerous failings in the child protection and legal system. By the time Gordon Campbell left office, B.C. courtrooms were in serious trouble. During Christy Clark’s first year as premier, the number of delayed and cancelled trials has shot up, meaning more criminals have walked free without seeing justice. And the Liberals can’t give us the cost the federal crime bill which could add hundreds of millions of dollars in new justice services.